With Hispanic Heritage Month here, we wanted to take a minute to tell you about the work we’re doing to improve education for Latino students, including the nearly 4 million Spanish-speaking English-language learners in U.S. schools today. 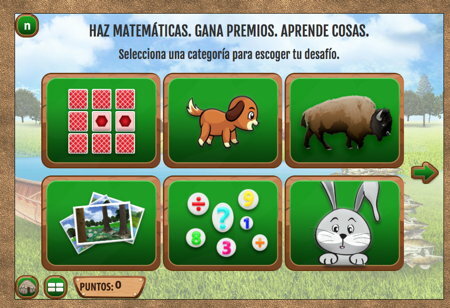 One of the ways we’re doing that is through our English/Spanish bilingual games. With games in two languages, we’re able to open our learning experiences to a whole new group of kids. Making Camp Bilingual started as a “summer project.” A game, we made for kids Grades 3-5 to have something to review while school was out. Of course, we quickly saw it grow into something bigger and year-round! Making Camp Bilingual teaches math, social studies and Spanish, or English if you’re a Spanish speaker. The math content focuses on multiplication and division. The social studies content teaches Ojibwe culture. Why Ojibwe culture? Our first games focused on Native American history, and it’s an interesting topic that transcends language barriers. Moreover, Native American in our games complements what students are learning in their history class during the year. Not only that, but players from Latin American countries can learn Native American history that they wouldn’t normally learn in class. As you play the game, you earn points for every answer you get right. You can trade in those points to purchase items for your own virtual wigwam. The bilingual portion works like this: by default, you hear instructions or watch a video in English and you have the option of clicking the “Español” button on every page to hear or read all of the content in Spanish. The goal of our game is to engage kids into something fun that will keep them motivated to earn points while learning math, Ojibwe culture and, of course, language – be it English or Spanish. Where else do you get an amazing app like that and just $1.99?! You can purchase Making Camp Bilingual for Mac, Windows & Chromebook: Just click here! Or for an iPad here! If you want to test it before purchasing, you can check out our English (only) version entirely free. On our site: Just click here!